An ongoing project investigating the etymology of the scientific names applied to aquatic species. 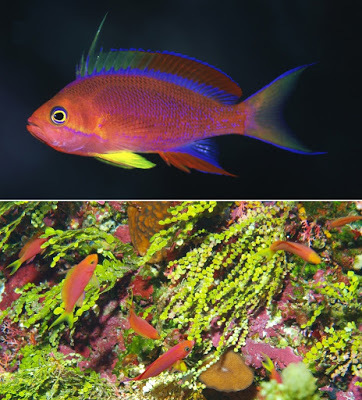 Two new species of tropical reef fishes. Pseudochromis stellatus, Batu Hitam, Raja Ampat Islands, Indonesia. The second species is an anthiadine serranid, or ‘Anthias‘ from the Ogasawara and Mariana Islands. Pseudanthias tequila, Image: N. Tsuji. Pseudochromis stellatus Gill, Allen, & Erdmann, 2017, the Greenhead Dottyback. 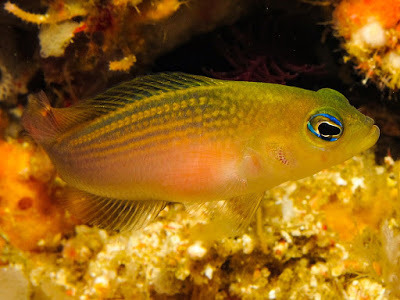 Pseudochromis – Greek, Pseudo-, pseudes (ψευδης), false; -chromis (χρομις), genus Chromis, referring back to the Greek, Chromis, a sea-fish (classical). Pseudanthias tequila Gill, Tea, & Senou, 2017, the Cave anthias (Japanese name: Bonin-hanadai. Pseudanthias – Greek, Pseud-, pseudes (ψευδης), false; -anthias (ανθιας), a catch-all common name for fishes of the Anthiinae, referring back to the Greek, Anthias , a sea-fish (classical). An Etymology of Tropical Marine Reef Species. This first volume takes a look at the etymology, that’s the meaning behind the names, of around 950 species of the most common tropical marine fishes found in the aquatic hobby. In addition to being an etymological dictionary of species and genus names AQUATICAL•LATIN also looks at subjects such as taxonomy, explains all about scientific names, and includes a handy guide to how these sometimes peculiar looking names should be pronounced. The perfect gift for the curious aquarist, a useful tool for public aquariums, academics, and an indispensable addition to any aquarist’s library. AQUATICAL•LATIN is a unique book, it is the only available general etymological work on fishes. Written by marine aquarium writer Tim Hayes. this is an extensively researched and well referenced work. EU and ROW: price subject to region, see appropriate Amazon site for details. 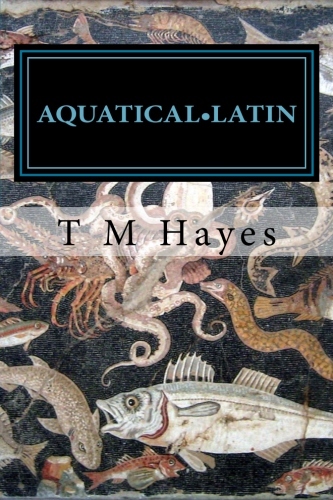 For more information about AQUATICAL•LATIN, the book, please contact AQUATICAL•LATIN via queries@aquaticallatin.info and we’ll do our best to answer your query. 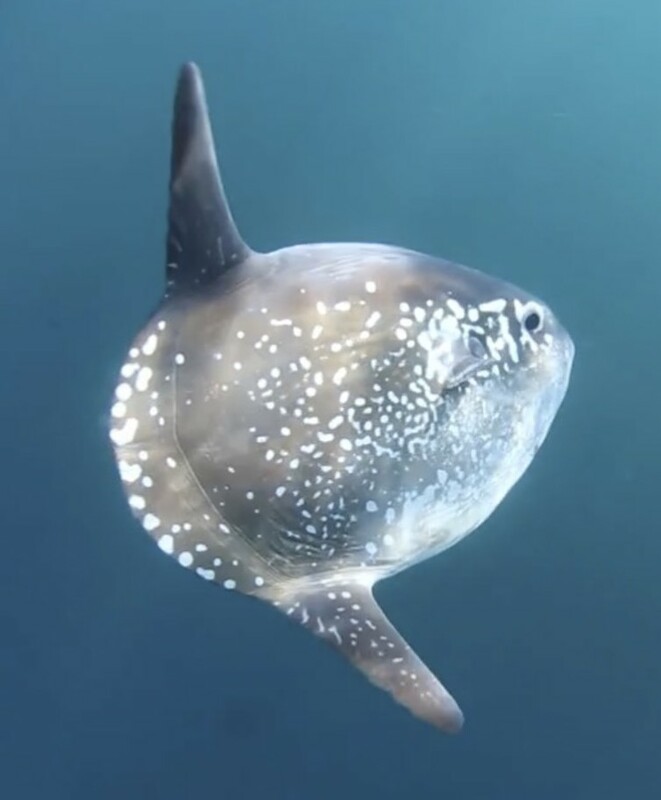 A new species of Ocean sunfish has been described in the paper, Hiding in broad daylight: molecular and morphological data reveal a new ocean sunfish species (Tetraodontiformes: Molidae) that has eluded recognition, published in the Zoological Journal of the Linnean Society. In 2014 a small specimen was found tangled up in fishing line, it was hauled out of the water to be freed, photographed and a genetic sample was taken. The search culminated with four fish being stranded in one go on the same beach in New Zealand. Ultimately enough fish were found to describe this species ranging in size from 50cm to nearly 2.5m. Unlike the other species, they don’t develop lumps and bumps as they grow. Their back fin is separated into an upper and lower part, with a small flexible piece of skin, which has been termed the “back-fold”, connecting the halves. Sunfish aren’t particularly rare, but they’re tricky to study as they live in parts of the ocean most humans don’t go. Their exact range is unknown but it seems to be the colder parts of the Southern Hemisphere. They’ve been found all around New Zealand (mostly around the South Island), off Tasmania, South Australia, Victoria and New South Wales (Australia), South Africa and southern Chile. It seems likely that, given its size, this will be the largest new species to be described this year. Mola – Latin, mill, millstone; grinders, molar-teeth. Alluding to the to the fact that the fish is similar in shape to a millstone (G. Rondelet De Piscibus Marinis1554). tecta – Latin, hidden; secret, concealed, disguised. Name alluding to the species having been hiding in plain sight for centuries. Two new species of fish, one from the Orinoco river drainage the other from the Xingu river of Brazil, have been described by a team of scientists from Oregon State and Brazil in a paper published in the journal Neotropical Ichthyology. The species of fish from the Orinoco River drainage, Leporinus enyae, has been named in honour of the Irish singer and songwriter Enya and her song Orinoco Flow, a song often played in the lab at Oregon State University where some of the scientists were working and which was felt to be appropriate tribute to the songwriter. Leporinus enyae Image: José Birindelli. The second newly discovered fish, Leporinus villasboasorum, has been named in honour of the pioneering efforts of the Villas-Bôas brothers, Orlando, Cláudio and Leonardo. In 1961 they succeeded in getting the entire upper Xingu legally protected, the first indigenous park in South America, leading to dozens of further parks being created around the continent. Leporinus is the largest and most diverse genus in the characiform family Anostomidae and includes roughly 90 species across most of South America. Many species swim in an oblique head-down position earning the family the common name of Headstanders. Most species are herbivores or detritivores and they occur throughout South America with the exception of the east Andes. Both new species are comparatively small, around 20 to 25 cms long, although larger members of their family can reach a length of 60 cms. Some smaller members of the family make their way into the aquarium trade. The term Leporinus literally means “little hare,” in reference to the large teeth that protrude from the mouth, much like those of a rabbit. The bottom teeth of the two new species are particularly long, and while no one is sure why, the researchers note that it may relate to their foraging on plants, worms and other invertebrates. Leporinus – Latin, of or like a hare (classical – Pliny). Named in allusion to the large teeth that protrude from the mouth, much like those of a rabbit. The Grant Zoology Museum in London has announced a Whale Weekender this weekend (8th – 9th July). Members of the public are invited to come along and help clean the bones of a Northern bottlenose whale and then assist in reassembling the skeleton. The “great fish” as it was called was caught 157 years ago by two Somerset fisherman and was a sensation at the time. 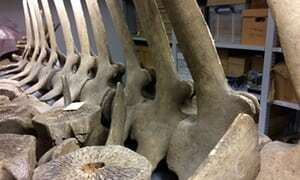 The eight metre long carcass went on a tour of the west country and the skeleton was then put on display hanging from the ceiling of the museum in Weston-super-Mare. It was dismantled in 1948 and then transferred to the Grant Museum of Zoology and Comparative Anatomy in London. Although the skull has remained on display there has never been space to display the entire skeleton so the rest of the bones have been held in storage. This weekend offers the first opportunity to check if the skeleton is complete, all the bones will be brought together for cleaning before being laid out in their entirety and for the first time the largest specimen in the museums collection will be properly seen. The northern bottlenose whale (Hyperoodon ampullatus) is a species of bottlenose whale belonging to the family Ziphiidae, and is one of two members of the genus Hyperoodon. 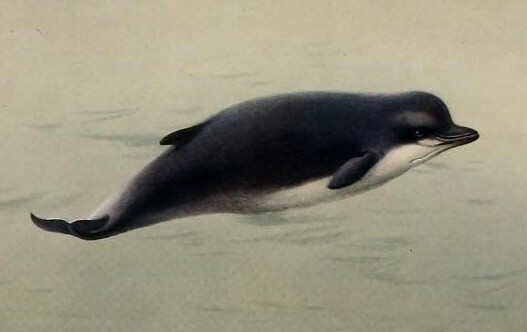 The northern bottlenose whale is endemic to the NorthAtlantic Ocean and was heavily hunted in the 19th and early 20th centuries. Mature specimens measure around 10 metres in length and are estimated to weigh in the region of 5,800 to 7,500 kilograms. The species is significantly larger than the related Southern bottlenose whale of the southern hemisphere. The beak is long and white on males but grey on females. The falcate (sickle-shaped) dorsal fin is relatively small and set far back on the body. It is one of the deepest diving mammals known, reaching depths of 1453 m hunting for squid and fish near the sea floor and staying submerged for an hour or more. Despite being a deep diving species they are sometimes seen, in small numbers, playing and resting in shallow waters and can be playful and curious towards human vessels. A Northern bottlenose whale was in the news in 2006 when one was spotted in the Thames reaching up river as far as the Albert bridge. Attempts to rescue it failed and its skeleton is now in the Natural History Museum, London. Hyperoodon – Greek, Hypero-, hyperoon (υπερων), the upper part of the mouth, the palate; -odon, odous (οδους), tooth. “Hyperoon, in Greek, means palate; and odos means tooth.” * Named in reference to the presence of teeth on the surface of the palate. 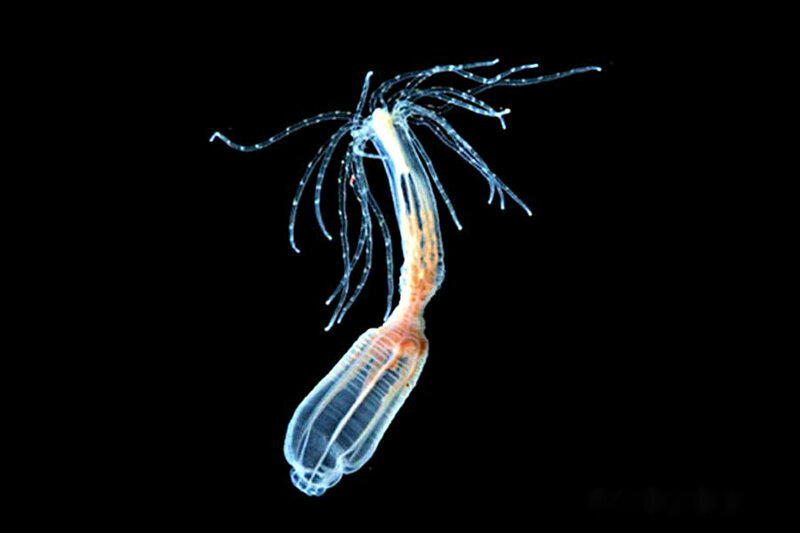 A small sea anemone, Nematostella vectensis, has recently featured in a number of news stories regarding the future possibility of regenerating human heart tissue. In a study published in the journal Proceedings of the National Academy of Sciences, scientists from the University of Florida have found genes known to help form hearts cells in humans in the gut of Nematostella vectensis. Interestingly, this anemone has the capacity to regenerate and, if cut into pieces, each piece has the capacity to grow into a new animal. The scientists believe that if they can learn how these genes give rise to heart cells that they may be able to figure out how to improve muscle regeneration in humans. Once genes are turned on in humans to create, for example, heart cells they cannot become any other type of cell, they can only be heart cells. In the anemone this fixation does not occur leaving cells free to become other types of cells or to fulfil other functions. Cell regeneration in the human heart is limited to a slow replacement of damaged cells resulting in a build-up of scar tissue. With further study its hoped to find ways of improving communication between human genes, mimicking the anemone’s capacity to regenerate, and advance our ability to treat heart conditions through regenerative healing. At the top of the column is an oral disk containing the mouth surrounded by two rings of long slender tentacles numbering between fourteen and twenty, the outermost being longer than the inner ones. 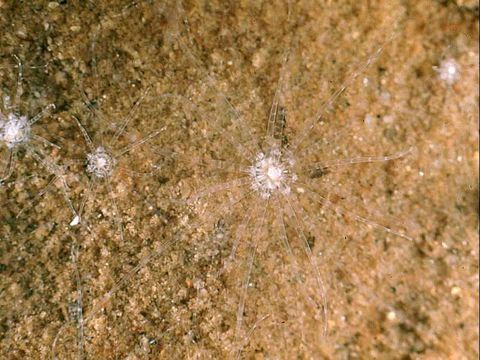 It is translucent and largely colourless but usually has a pattern of white markings on the column and white banding on the tentacles. It is found on the eastern and westward seaboard of North America with a range extending from Nova Scotia to Louisiana on the east coast and from Washington to California on the west coast. It is also known from three locations in the United Kingdom, two in East Anglia and one on the Isle of Wight. Typically found in shallow water in brackish ponds and lagoons, and in ditches and pools in salt marshes. Nematostella vectensis is used as a model organism in a number of fields including developmental biology, ecology, the study of evolution, reproductive biology. and has a dedicated genomics database. It is easy to care for in captivity and reproduces readily in the laboratory. Nematostella – Greek, Nemato-, nematos (νηματος), that which is spun, thread, filament; Latin, -stella, star. Likely alluding to the thread-like form of the tentacles and the star-like markings surrounding the oral disc. vectensis – Latin, of, or coming, from the Isle of Wight; vectis, an island south of Britain (classical – Pliny). The type locality for the species is at Bembridge, on the Isle of Wight. Millions of glowing sea creatures called pyrosomes have started to “bloom” off the coast of the Pacific Northwest of the US and Canada. The creatures are filling up fishing nets, clogging hooks and research gear and befuddling scientists who have no idea why populations of the tube-like organisms are exploding. “Call it the invasion of the pyrosomes,” writes Michael Milstein in a post on the National Oceanic and Atmospheric Administration’s (NOAA) Northwest Fisheries Science Center website. They started to show up in the spring and in the past month or two, swarms of the animals been spotted all over the region. Pyrosomes are pelagic colonial tunicates. 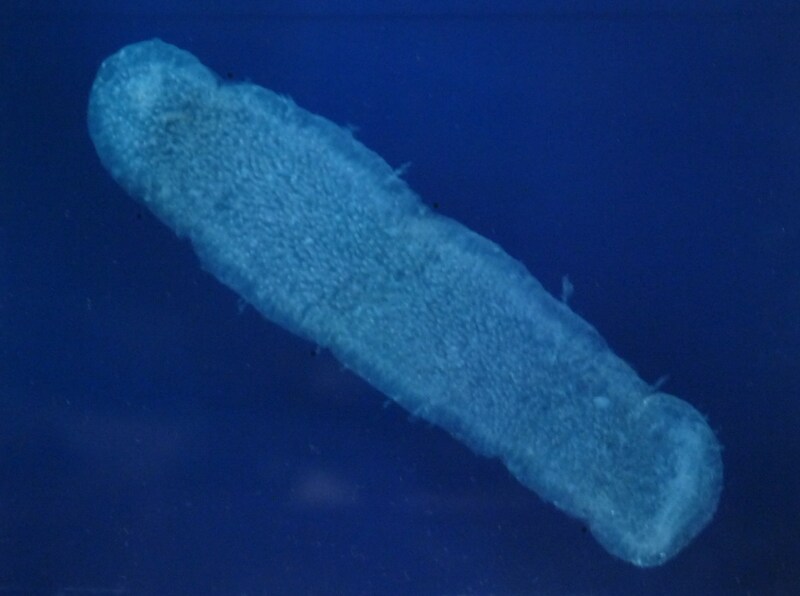 A colony can grow up to 60 cm in length, forming a distinctive rigid tube that may be colorless, pink, grayish or blue-green. One end is closed and tapered, with the opposing open end having a diaphragm. The colony comprises of numerous individual organisms known as zooids around 8.5 mm long and is capable of emitting a bright bioluminescence. Tunicates are curious creatures and include numerous species with different forms and lifestyles including the sessile Sea squirts and Sea tulips along with the mobile Salps. Although at first glance they would appear to be some form of invertebrate they are classified as belonging to the Phylum Chordata making them related to vertebrates such as mammals, fishes, reptiles, and birds. The reason for this classification is that the mobile tunicate larvae possess a structure called a notochord which, in the vertebrates, develops into the vertebral column, more widely referred to as the backbone or spine. As the species responsible for the current bloom has not been specifically named, for the purpose of this edition of “Aquatic scientific names in the news …” I’m exploring the etymology of the type species of pyrosome, Pyrosoma atlanticum which is likely the species in question. Pyrosoma – Greek, Pyr- (πυρ), fire; -o-, connective vowel, -soma (σωμα), body. Name referring to the bright bioluminescence characteristic of the species. atlanticum – Latin, atlanticus, of the Atlas mountains – Atlas, Atlantis, western limits of the classical Old World; of or from the Atlantic Ocean (modern). A sudden change in the colour of the Bosphorus Strait has been reported from Istanbul, Turkey. The usually blue waters of the Bosphorus have been transformed to a milky turquoise since the weekend reportedly alarming some residents. This colour change is the result of a surge in a species of plankton across the Black Sea. The species responsible is Emiliania huxleyi (sometimes referred to as Ehux), a type of phytoplankton known as a coccolithophore and the most abundant and widespread of coccolithophore species. 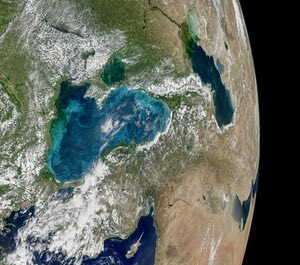 Nasa describes the phytoplankton bloom as being an annual occurrence driven by a seasonal increase in reflectivity of the Black Sea, with peak brightness occurring in June, and that it’s consistent with recent years, although this manifestation would appear to be the brightest of the past five years. Emiliania huxleyi is named after Thomas Huxley and Cesare Emiliani, who were the first to examine sea-bottom sediment and discover the coccoliths within it. Emiliania huxleyi is plated with white calcium carbonate coccoliths and, when present in large numbers, gives the water a milky sheen, changing its colour. 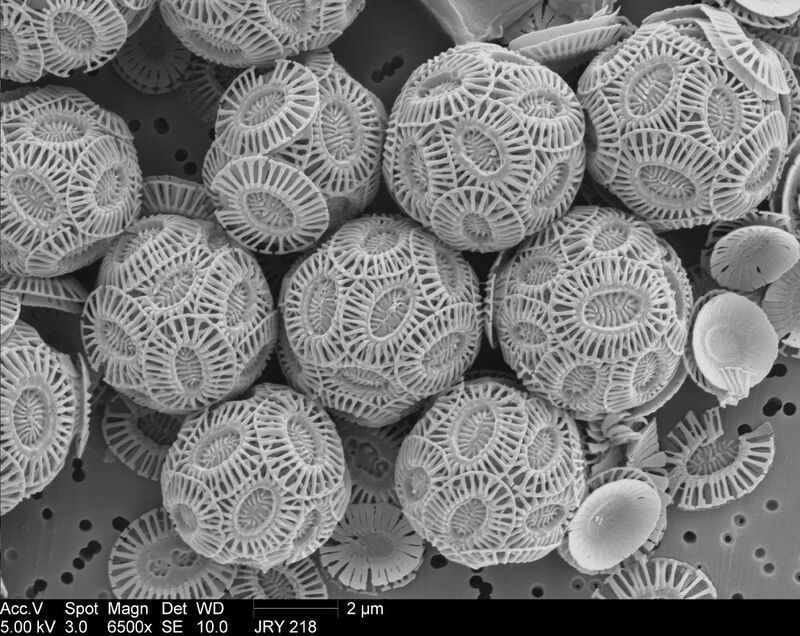 Coccolithophore – any of the many minute, mostly marine, planktonic organisms with brown chromatophores and complex calcareous shells. Coccoliths are the individual plates of calcium carbonate formed by coccolithophores, single-celled algae such as Emiliania huxleyi, which are arranged around them in a coccosphere. The name was coined in 1868 by Thomas Huxley to describe the minute round or oval disk-like organic bodies found in deep-sea dredging, and also fossilized in chalk. Coccolithophore – Greek, Cocco-, coccos (κοκκος), grain, seed: -litho-, lithos (λίθος) stone; -phore, phoros (φορος), bearing. Emiliania – Latinized surname. Honouring Italian-American geologist and micropaleontologist Cesare Emiliani, (1922 – 1995), the founder of paleoceanography. huxleyi – Latinized surname. Honouring English biologist Thomas Henry Huxley, (1825 – 1895), popularly known as Darwin’s Bulldog for his advocacy of Charles Darwin’s theory of evolution. This new species, subsequently described as Palatogobius incendius, was observed and collected over the course of several submersible dives off the coasts of Curaçao and Dominica between 2013 and 2016 as part of the DROP project (see below). During this same time lionfish predation of the then undescribed species of goby was also observed and recorded by the Curasub submersible. The description of both the new species and the lionfish predation can be found in “A new mesophotic goby, Palatogobius incendius (Teleostei: Gobiidae), and the first record of invasive lionfish preying on undescribed biodiversity” at PLOS One. Palatogobius incendius, live in an aquarium. Image: Barry Brown. Specimens of Palatogobius incendius, were collected by the Curasub using the two hydraulic arms, one equipped with a quinaldine-ejection system to anesthetize fishes, and the second equipped with a suction hose to collect immobilized individuals. Captured specimens were stored in a vented acrylic container for transport to the surface. The depth range from which these fishes were collected from is termed mesophotic, a term used to describe coral reefs growing from around 30 m down to around 150 m in both tropical and subtropical water. Mesophotic, a modern scientific term derived from ancient Greek, Meso-, mesos (μεσος), middle; and phot- (φωτ-, φῶς), light; -ic, suffix meaning after the manner of, of the nature of, pertaining to, of. Image: School of Palatogobius incendius at type locality, sta. 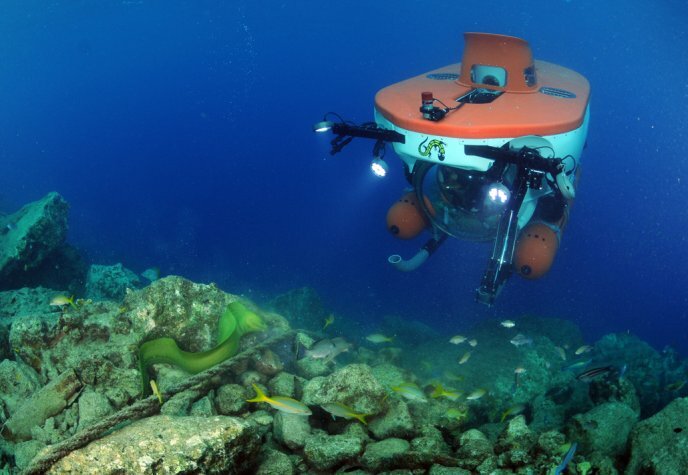 CURASUB15-30, 152 m depth, Curacao. Palatogobius incendius has been collected on deep reefs at depths of 88 to 200 metres from Curacao and Dominica and observed off Roatan, Honduras. The species occurs exclusively in hovering schools ranging in size from as small as 5 to 10 individuals (rare) up to 50 to 200 individuals. 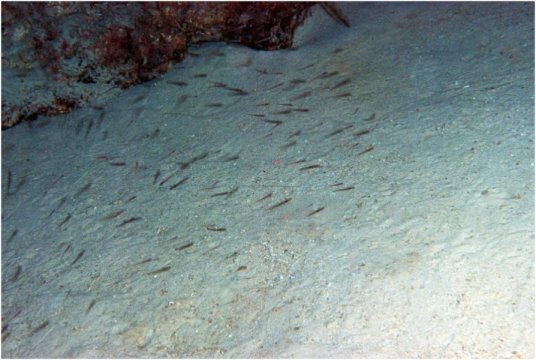 Schools are most frequently found at the top or bottom of vertical walls off Curaçao and Dominica, but off Roatan more than a dozen schools of P. incendius were observed collectively comprising as many as 1000 individuals over a long, gradually inclining stretch of sand and small rocks from around 150 to 170 m depth. Schools of P. incendius generally comprise individuals at multiple life stages, ranging from moderately developed larvae to adults. Off Dominica larger swarms of minuscule fish (about 5 mm TL) were also observed, possibly very recently recruited P. incendius larvae, given their size, abundance and depth range. Individuals in these swarms were too small to be captured, and were observed traveling only a few cm off the bottom rather than hovering in a cloud well above the substrate. These schools of post-larvae were 1–2 m wide and up to 5 m long, and moved steadily upslope at approximately 0.15 m/s, navigating laterally around obstacles in a fashion superficially similar to a wide chain of marching army ants. The schooling behaviour of Palatogobius incendius may be leaving them open to the danger of lionfish predation, with their schools being easily driven or corralled by the lionfish into corners of the reef where they are vulnerable to predation. In recent years the Smithsonian’s Deep Reef Observation Project (DROP) has contributed a significant body of information on the taxonomic makeup of deep-reef fish communities in the Caribbean. Through the use of Substation Curaçao’s (www.substation-Cuaracao.com) manned submersible, the Curasub, DROP researchers have described many new species of deep-reef fishes, including several that may be susceptible to lionfish predation due to their body size, shape, and behavior. That a previously unknown species was collected for the first-time whilst simultaneously being found to be susceptible to predation by invasive lionfish species raises the question of how many other new species are in danger before they’ve been discovered. The greater depths where these new species are being discovered is also the reason behind their discovery. Depths beyond the range of conventional scuba diving are being opened up to discovery through the new technology of submersibles such as the Curasub and through new advanced diving techniques, unfortunately these greater depths also represent an environment where the lionfish feels at home. Lionfish are invasive species from the Indo-Pacific, likely introduced into Atlantic waters through the marine aquarium trade either as escapees or as released specimens. They are primarily crepuscular hunters, and hunt more actively on overcast days with less light and at greater depths. In the western Atlantic lionfish are tolerant of, and thrive at, the cooler temperatures of the deeper reefs, where they have become locally abundant. This is especially concerning for native deep-reef fishes that occur from 50–300 m, where reduced light conditions may make them more susceptible prey for actively hunting lionfishes. The composition of these deep-reef fish communities differs from that of shallow reefs, and is made up primarily of a unique fauna that includes many undescribed species. This results in a community of poorly known or undescribed species that may be negatively affected by invasive lionfish. 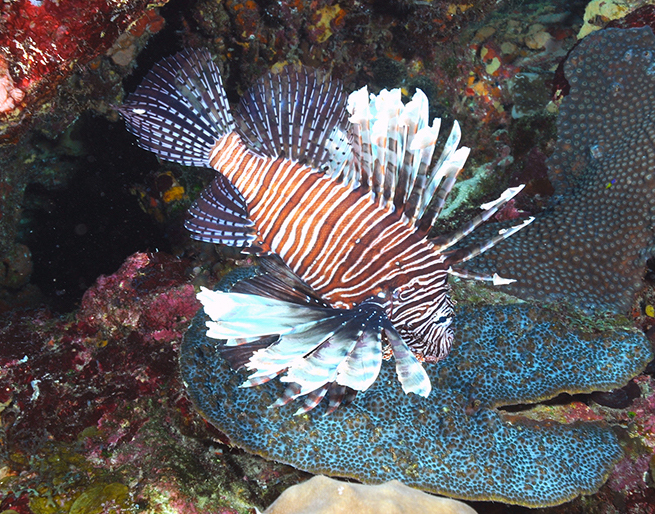 To date little is known about the lionfish predation on deep-reef fish assemblages. Palatogobius incendius Tornabene, Robertson & Baldwin, 2017, the Ember Goby. During the course of a new deep-sea research voyage called Sampling the Abyss a fish not seen since the Challenger expedition of 1872–76 has been collected. A species of Cusk-eel that has been described as faceless owing to its lack of visible eyes was collected on day 16 of the expedition. It was brought up from a 4000 metre deep trawl from a sampling site off Newcastle, New South Wales. Initially it was thought to be a new species but the latest from John Pogonoski of CSIRO Australian National Fish Collection seems to indicate it to be the same species as from the Challenger expedition. Sampling the Abyss is a month-long voyage aboard the RV Investigator exploring the abyss off eastern Australia for the first time – an almost unexplored habitat 4000 metres below the surface. The abyss is the largest and deepest habitat on the planet, covering half the world’s oceans and one third of Australia’s territory, but it remains the most unexplored environment on Earth. Until recently only a handful of samples had been collected from Australia’s abyss. The expedition expects to find a wide range of animals, including new species, of fish, starfish, molluscs, crabs, sponges, marine worms and sea spiders. More information about the expedition can be found at Blogging the Abyss. The Challenger expedition of 1872-76 laid the foundations for the science of oceanography. At the behest of Charles Wyville Thomson the Royal Society obtained the use of HMS Challenger from the Royal Navy for an expedition to survey and explore the world’s oceans. The ship was modified for scientific work and equipped with laboratories for natural history and chemistry. The expedition, led by Captain George Nares under the scientific supervision of Thomson himself, travelled around 130,000 km over the course of the voyage. The results were published as the Report Of The Scientific Results of the Exploring Voyage of H.M.S. Challenger during the years 1873-76. It cataloged over 4,000 previously unknown species and was described by John Murray (who supervised the publication) as “the greatest advance in the knowledge of our planet since the celebrated discoveries of the fifteenth and sixteenth centuries”. Typhlonus – Greek, Typhl-, typhlos (τυφλος), blind; -onus, onos (ονος), hake (classical – Aristotle). nasus – Latin, nose. Likely referring to the protuberant snout. Latin & Greek – English Lexicon. An introduction to the ancient Greek alphabet. Words relating to number or quantity. 1916 Robert Rush Miller (1916 - 2003) was born on this day. He was a US ichthyologist specialising in freshwater fishes, a protegé of and collaborator with Carl Hubbs (also his son in law); after a brief period at the Smithsonian Institution (1944-48) associated with the Department of Zoology and Museum of Zoology at the University of Michigan until his retirement in 1987. Miller's early field experiences in California led him to an interest in the desert pupfish, a lifelong theme in his research. Miller's more than 250 publications, including Freshwater Fishes of Mexico (2004) covered a wide range of subjects including studies on zoogeography, life histories, paleogeography and paleoclimatology, variation, hybrid forms, etc., with a geographical emphasis on Mexican and Great Basin forms. Miller is honoured in the name of a genus Millerichthys and in the names of a number of species under milleri and bobmilleri.